It all came to a head this past fall. When “Francafrique’s”(1) man in Africa, Blaise Compaore tried to amend the Burkinan constitution to run for a fifth term, to retain his 27 year hold on power, people, many of them the country’s youth, poured into the streets of the country’s Ouagadougo and in other cities in a national movement of opposition. The country has a long history of social movements standing up for economic and political reform. The events in Burkina Faso are reminiscent of those in Tunisia. At the time that Zine Ben Ali was forced to flee Tunis, he also was trying to engineer a way to change the Tunisian constitution, not so much to personally remain in power personally but to open the doors for a presidential bid by his wife, the infamous (at least for Tunisians) Leila Trabelsi and her greedy siblings. The Burkina Faso – Tunisia example does not end there. Further, Compaore’s exit from Burkina Faso was greased by both by France and the United States, neither of which, until the advent of the Arab Spring, have had much of a tradition of supporting radical social change in the Third World as Algeria, Vietnam, Chile, Madagascar, Cambodia and dozens of other interventions amply demonstrate. Interestingly, rather than supporting Compaore’s extended tenure in power, both the world’s greatest military power, even if in decline, the United States and its strategic sidekick of late, France,(remember Libya, Mali, Central African Republic) together, discouraged Compaore from clinging to power. As, obviously with a little help from friends, Ben Ali and his entourage found sanctuary in U.S. ally Saudi Arabia, so Compaore too, got by with a little help from his friends. He was, as Anne Frintz notes in an article in the December issue of Le Monde Diplomatique, removed from Burkina Faso in a helicopter provided by the French government and given refuge in French ally Côte d’Ivoire (Ivory Coast). There is yet another similarity between the two countries – although admittedly from an economic and social viewpoint they are vastly different. Still, their roles are somewhat similar for the United States and France, the two foreign powers most directly involved in Burkina Faso’s future, which together hope to “manage” the chaos, the political changes, so that while there is a power shift at the top that both the political economy of the country and its strategic position in Africa remain fundamentally unchanged.There is the distinct impression that recognizing that Compaore’s popularity had long faded, played a role in his departure, hoping to avoid a more radical alternative emerging. They had squeezed all the political juice possible out of Blaise Compaore and there was little left to do but to discard the residue. For all its current problems Tunisia is considerably more developed economically with a much more educated population and a much more sophisticated workforce than Burkina Faso. Burkina Faso is economically more important for France, but strategically important to the United States. Over the past decade France and the United States, often competitors for influence in Africa have drawn closer together in a kind of strategic partnership in which the United States is the senior, France, essentially, the junior partner. The cementing of this alliance was most vividly expressed in the joint and successful NATO-led effort to overthrow Khadaffi in Libya, but is also manifested in the joint approach to Syria, Iran and much of Africa. The cooperation between the two in trying to “manage” the changes in Burkina Faso is yet another example. Will Burkina Faso become yet an other example of an uprising that – with a little help from outside forces – had the political strength to overthrow dictators who have stayed too long in power and gotten too greedy (Marcos, Mobutu, Ben Ali, Mubarek, Khadaffi, etc) but not enough strength (or vision) to change the underlying socio-economic and political systems which these U.S. and French-backed skunks managed? Is it yet another case of where the United States and France either facilitated – in cooperation with the opposition movement and the military – the removal of a former strongman whose usefulness had run its course – recognizing that after all these years Blaise Compaore had moved from the “asset” to the “liability” category? How far will the political and economic changes unfold needed to put this dirt poor country on a new path? Or will what has happened in Burkina Faso, in the end, be more cosmetic than genuine – a few new faces at the top still in the grip of Paris and Washington, a few show trials of the most egregious cases from the Compaore days, the old economic and political elite with a few new faces remaining in control under the guise of a “new” political party or formation? Will the excitement, the rage at injustice, corruption, seething poverty which propelled the people of Ouagadougou into the streets to face death transform the country and propel it on a new course, …or when all is said and done, will it be the same-old, same-old, old wine, new bottle, all the changes necessary to maintain the status quo? How far will the political and economic changes unfold needed to put this dirt poor country on a new path? Or will what has happened in Burkina Faso, in the end, be more cosmetic than genuine – a few new faces at the top still in the grip of Paris and Washington, a few show trials of the most egregious cases from the Compaore days, the old economic and political elite with a few new faces remaining in control under the guise of a “new” political party or formation? Will the excitement, the rage at injustice, corruption, seething poverty which propelled the people of Ouagadougou into the streets to face death transform the country and propel it on a new course, …or when all is said and done, will it be the same-old, same-old, old wine, new bottle, all the changes necessary to maintain the status quo? Burkina Faso: One of the world’s poorest countries. 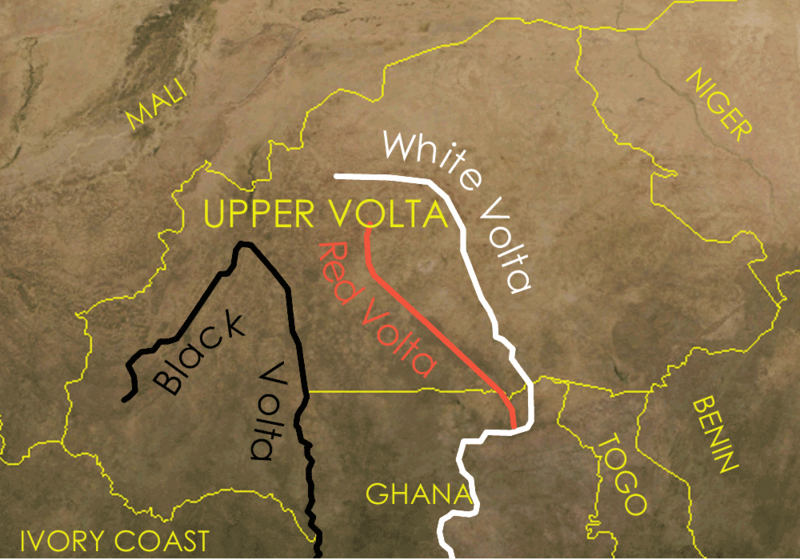 Winning its independence from France in late 1958, Burkina was then called Upper Volta, because the three sources of the Volta River (color-coded the Black, White and Red Volta) all have their sources in the country. They merge together to form the Volta River further south in Ghana. Carved out of what was known as French West Africa (Afrique occidentale française), Upper Volta was one of eight countries that gained independence from France in the late 1950s and early 1960s, the others being Mauretania, Senegal, French Sudan (now Mali), French Guinea, Ivory Coast (Côte d’Ivoire), Dahomey (now Benin) and Niger. Their independence was in large measure shaped by Paris in such a way as to preserve to a very significant degree French economic and strategic interests in Africa which have continued until present. The name changed to Burkina Faso in 1984 when its then President, Thomas Sankara changed the name, the English translation of which is “Land of Upright Men.” Considered a kind of Patrice Lumumba, ie, radical nationalist trying to free his country of French neo-colonial control, Sankara’s rule was cut short a few years into his rule. He was assassinated by Blaise Compaore, with the complicity of the French secret services. Like many other African countries, despite mineral and agricultural resources that could help fuel socio-economic development, Burkina Faso is a terribly poor country. Index Mundi describes it as “a poor African country that counts on adequate rainfall. 90% of the population is engaged in subsistence agriculture and cotton is the main cash crop. In July, 2014, the population was estimated to be 18.3 million of whom 8.6 million (46%) were under the age of 18. The country has few natural resources and a weak industrial base. Cotton and Gold are the main export products. Nearly 47% live below the poverty line.” A decade ago, the unemployment rate stood at 77%. According to the latest UNDP statistics, Burkina Faso ranks towards the bottom – 181 out of 189 countries in its human development index that measures life expectancy, mean years of schooling and gross national product. Translation: it is one of the world’s poorest countries with the lowest life expectancy (56 years of age), an average of 1.3 years of schooling. According to one World Bank method of measurement, in 2012, per capita GNP stood at $673 which comes to about $1.84 a day. Healthcare infrastructure remains fragile. While it is true that since 1990, infant mortality has been cut in half from 202 to 102 deaths per 1000 births, it is still one of the highest in the world though despite the progress, this according to UNICEF. Compare that with 6.7 per 1000 in the USA, or 2.3 per 1000 in Japan, one of the lowest for the same year (2012). Child labor is rampant: almost 40% of children aged 5 to 17 – that is some 3.4 million – are estimated to be part of the labor force. Although cotton production remains the country’s economic mainstay, gold mining is playing an increasing role. In 2009, gold surpassed cotton as the country’s major export. Burkina Faso exported some 32 tons in 2013, this mined in large measure by Canadian based mining companies. 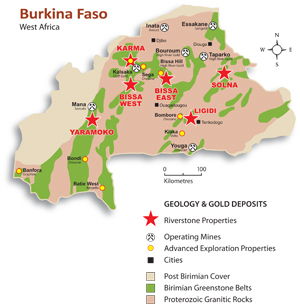 That Burkina Faso has reserves of gold has been known for some time, but these have been especially developed over the past decade as the country is now the fourth largest gold producer in Africa. Other mineral commodity sources include cement, dolomite, granite, marble, phosphate rock, pumice, other volcanic materials, and salt, but gold mining has much more potential. Under Blaise Compaore’s rule, Burkina Faso has been described as “a mining friendly nation” welcoming foreign mining interests to develop new gold mines. Offering generous terms to foreign companies, the country’s mining industry has hardly fueled much-needed socio-economic development. Part of the protests which brought down Blaise Compaore included looting foreign own gold mines. Also, in a number of other mines, miners went on strike for improved salaries and working conditions. With the new political realities, these mining companies are worried that the terms of their contracts might be altered to benefit Burkina Faso more than their stockholders. Countries in political transition, in need of cash infusions make easy targets for powerful multi-national mining companies wanting to exploit the countries resources on the cheap. As in the Democratic Republic of Congo and Guinea, in Burkina Faso, the initial contracts signed by transitional governments that overthrew dictators are now being reviewed. Burkina Faso’s mining sector is divided into two organizational structures: artisanal and industrial mining. 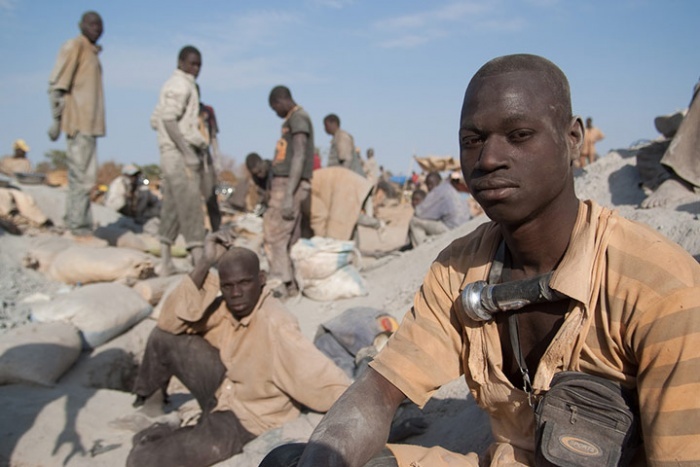 There are over 200,000 mining sites in Burkina Faso, many if not most of them located in remoter parts of the country and mined by child labor. Artisanal mining is essentially wildcat mining done by individuals who scratch out a living by doing very primitive mining under what can only be considered inhumane conditions – not unlike coltan mining in the Congo. Families suffering from years of Sahel famine often encourage their children to earn some extra money by literally digging holes in the ground. The average wage rate in the country is less than $2 a day but a family employed in artisanal gold mining can earn between $5 and $40 a day, depending on the mine. That’s led to many parents pulling their own children from school to help in the mines. The gold thus mined – it is usually in very small amounts – is then sold to trading companies for very low prices, who in turn sell it on international gold markets. It is this kind of mining that takes on all kinds of illegal and illicit forms of labor – forced, slave, child labor. The laws aside, it is essentially unregulated by the state. SEMAFO (SMF:TSX) – Mana mine located 350km west of the capital of Ouagadougou and is set to produce 200-220koz of gold in 2014 (100% of the company’s production). Quebec, Canada based. True Gold Mining (TGM:TSXV) – Karma development project which is now funded and is well into construction (100% of the company’s assets). Located 185km northwest of Ouagadougou. Vancouver, Canada based. Roxgold (ROG:TSX) – Yaramoko is one of the highest grade undeveloped gold deposits in the world and is about to start construction. They are working on finalizing loan documentation on a $75 million facility package which could present problems if the lenders get scared. (100% of the company’s assets). Located roughly 200km southwest of Ouagadougou. Ontario, Canada based. Orezone (ORE:TSX) – Bombore development project is located 100 km southeast of Ouagadougou. It is moving forward with a few studies, but has been fairly inactive recently so there should be less impact here. Bombore represents essentially all of Orezone’s value. Ottawa, Canada based. Nordgold (NORD:LSE) – Bissa gold mine is located approximately 85km north of Ouagadougou. The company also operates the Taparko mine located 200km northeast of Ouagadougou. Combined, the two projects account for almost 40% of the company’s revenues. Netherlands based. Will these foreign companies have to make what amounts to minor adjustments in the new political situation, or will their relationship with Ouagadougou be fundamentally changed so that they serve more the interests of the people of Burkina Faso and less that of their stockholders? 1. “Francafrique” refers to a series of informal but powerful networks that tie French political, corporate and military elite with African partners in such a way as to further French economic and strategic interests in Africa in the post-colonial period. The exact make up the networks has shifted over time, early ones dominated by De Gaulle’s sidekick Jacques Foccart, others by Francois Mitterand, Charles Pasqua and Nicolas Sarkozy among others. Major French companies in Africa – Total, Bolloré, Areva among them have greatly benefited from these long-term relations. 2. There was some repression, at least three deaths, but compared with how violent things can get in these situations, the transition was relatively smooth. 3. Given that the survey was done in five of the country’s thirteen regions, the 20,000 figure is conservative. These children are among the 115 million between the ages of 5 and 17 years of age “working in hazardous conditions across the world.” Hazardous child labor is classed by the International Labour Organization (ILO) as one of the worst forms of child labour. The ILO describes it as “work in dangerous or unhealthy conditions that could result in a child being killed, or injured and/or made ill as a consequence of poor safety and health standards and working arrangements.” According to the ILO, of that global number, some 22,000 a year die as a result. Who Is Behind The Ousting of President Compaore in Burkina Faso?